Fabian Schar celebrates scoring his second goal. Fabian Schar shrugged off the plaudits after firing Newcastle United out of the relegation zone. The defender netted twice in Saturday’s 3-0 win over Cardiff City. Ayoze Perez also found the net at St James’s Park. The 27-year-old, signed from Deportivo La Coruna last summer, took the ball just inside Cardiff’s half and ran, unchallenged, towards the box. Schar rolled the ball past goalkeeper Neil Etheridge with his weaker left foot after reaching the visiting box. The most important part was taking three points out of such a big game, but to score my first goals for Newcastle makes it a great day for me personally. “I just feel so happy to have played a part in such an important victory,” said Schar. “The most important part was taking three points out of such a big game, but to score my first goals for Newcastle makes it a great day for me personally. I’m really happy. “The first one was pretty cool – I have not scored too many like that! I do not know what I was thinking when I set off on that run. Everything just went for me, and the pitch opened up. “In those moments, you’re not really thinking about scoring or what might happen. “In this case, everything was good, and then suddenly the shot was on. And I even scored with my left foot, and that won’t happen very often either! It’s great to help the team, though the most important thing is the three points. 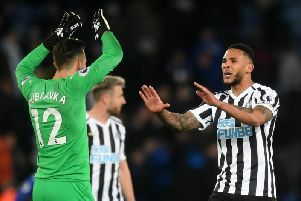 Schar got the final touch after Jamaal Lascelles flicked on a Matt Ritchie corner in the second half to put Newcastle 2-0 up. The Switzerland international put another chance over the bar. Asked if he had been looking for a hat-trick, Schar said: “No, not really thinking about a hat-trick. I’m perfectly satisfied with two goals – I don’t want to be too greedy! Newcastle had dropped into the bottom three after the previous weekend’s defeat to Chelsea at Stamford Bridge. “We knew what was at stake,” said Schar. “When you drop into the bottom three, you can feel that pressure building on you. It’s not easy. “We also knew before this month that we have some difficult games against the top teams, and that there was always a chance we could drop into those places. We have to take it game by game, but we have given ourselves some breathing space and have to take advantage. The league table looks a bit better for us now. Schar, so comfortable on the ball, had been fielded in midfield in last week’s FA Cup replay against Blackburn Rovers at Ewood Park. “I will do my best wherever I play, of course,” said Schar. “I’m not a frustrated Messi but I enjoy doing my best, for the team and doing a good job wherever I play. “I don’t really care where I play, even though I’m primarily a defender. I have played in midfield when I was younger and enjoyed it. So it’s not as if it’s completely unusual for me. Schar and his team-mates, for once, left St James’s Park with smiles on their faces. “I have a smile on my face, and I hope our fans will be smiling too,” said Schar. “We have had some really difficult days in front of our supporters this season, and we’re all just so desperate to show them something when we play in front of them. “They’re great fans, and we have needed them and will need them again in the future. It’s the best feeling in the world to win for them.